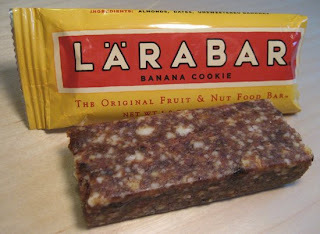 Have you ever tried a Lärabar? I was looking for a little something sweet yesterday, but I didn't want it to be full of crap. So one by one, I turned over the 'healthy' candy-like energy bars, reading the contents and nutritional info. When I got to the Lärabar, I couldn't believe it. I actually had to read the ingredients list 3 times. Get this -- there are only 3 ingredients in the Peanut Butter Cookie flavor: dates, peanuts, salt. That's it. Naturally sweet and savory, 5 grams of protein, 4 grams of fiber, 1.7 ounces of delicious. Lärabar also has a line of Jocolat (or chocolate) bars that I'd like to try. I don't think they're organic, but they do claim no genetically modified ingredients. And while the umlauts in the name suggest they come from some Scandinavian or Germanic land, the Lärabar is made right here in the USA by Humm Foods. You can get yourself a whole case, but you might want to try one first. It looks kind of like headcheese here, but I swear it's yummy! Right here in NYC, not far from the isle of Manhattan, whales are dodging cargo ships and singing their melancholy songs. 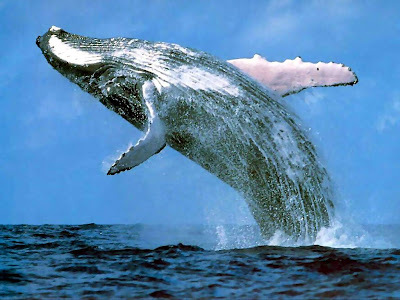 It's a first for the city, not their presence, but the recording of their sounds -- of humpback, northern right, and fin whales. This is an exciting time for New Yorkers. Just think, just miles from the Statue of Liberty, the Empire State Building, Carnegie Hall and Times Square, the great whales are singing," says Chris Clark, the Director of the Bioacoustics Research Program at the Cornell Lab of Ornithology. "These are some of the largest and rarest animals on this planet trying to make a living just a few miles from New York's shores. It just goes to show us that there are many important and wonderful discoveries to be made about the living world right here, right in our back yards.